Two actors take the stage and make wild cartoonish gestures and snappy remarks. This is not the latest sitcom in Hollywood or a new Broadway production but a drama about Guinea worm disease in rural Ghana. Hundreds of people in the community of Tugu squeeze on top of school desks around the dusty village center, craning their necks to see the performance. For the crowd, the humorous plot is entertainment worth leaving their homes for. For The Carter Center and Ghana's Guinea worm eradication program, the drama marks one more avenue for spreading the word about how to prevent the disease. Conveying public health messages can be a challenge in isolated communities where few people can read or write. Harkening back to ancient community theater in Greece and Rome, the drama brings education to life through the performing arts. "You can organize a community meeting, and people won't come out. But if you mention that you are going to do a drama, you see everyone rushing out to see the group," said Nyohini Baba, producer of the Suhuyini Drama Group. Dispelling the myths about a 3,000-year-old disease isn't easy. Many communities in northern Ghana hold strong beliefs that Guinea worm disease is the result of a curse or a genetic disposition that is passed down through generations. In truth, Guinea worm is contracted through drinking water contaminated with a larva that matures into a long, spaghetti thin worm after a year in a human body. The worm exits the body through an agonizingly painful blister in the skin. "Guinea worm is a thorn in our flesh. It brings poverty to the people because when one is attacked by Guinea worm, that fellow cannot go to the farm, that fellow cannot work," said Osmond Abdullah, Suhuyini's playwright. Abdullah has written seven plays on various aspects of prevention and treatment of the disease, including the importance of filtering water. In Tugu, a character that refused to filter his water becomes infected with Guinea worm. As he limped into view, he gripped his foot and screamed with each step. The audience shrieked with delight watching the big man cry like a child. To keep the audience interested, the plot is filled with action, comedy, and romance. 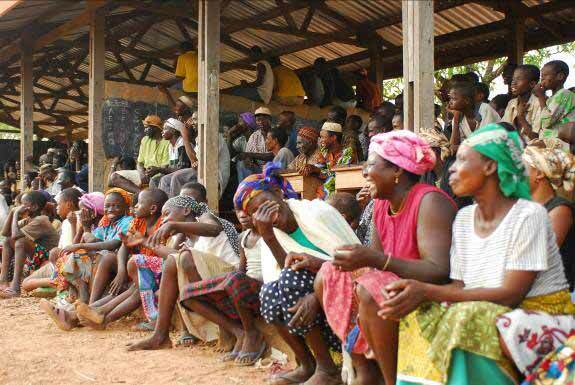 "Humor helps the audience feel comfortable with talking about the disease and, in effect, reduces the stigma associated with it," said Philip Downs, assistant director of the Center's Guinea Worm Eradication Program. "When stigma is reduced, people no longer hide their cases of Guinea worm, and health workers can contain all cases of the disease before infected people recontaminate the water source." In the play "Let's Eradicate Guinea Worm" performed in the community of Tugu in northern Ghana, emphasis is placed on filtering water to prevent Guinea worm disease, and stopping people with Guinea worm from entering and contaminating water sources. Guinea worm disease is set to be one of the next diseases eradicated. Ghana is the most Guinea worm-endemic country in West Africa, and second in the world only to war-torn Sudan. Together, Sudan and Ghana shoulder 99 percent of the world's remaining cases. 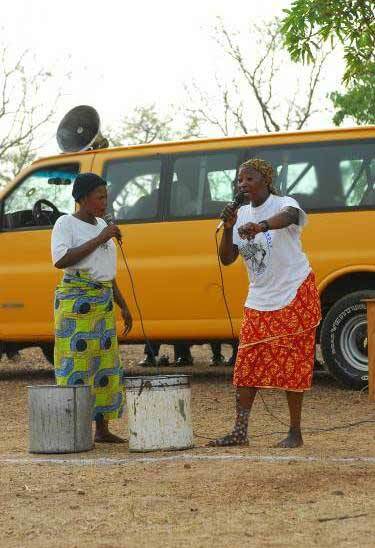 The Suhuyini Drama Group uses comedy in their performances to capture the audience's attention and reduce the stigma surrounding Guinea worm disease.